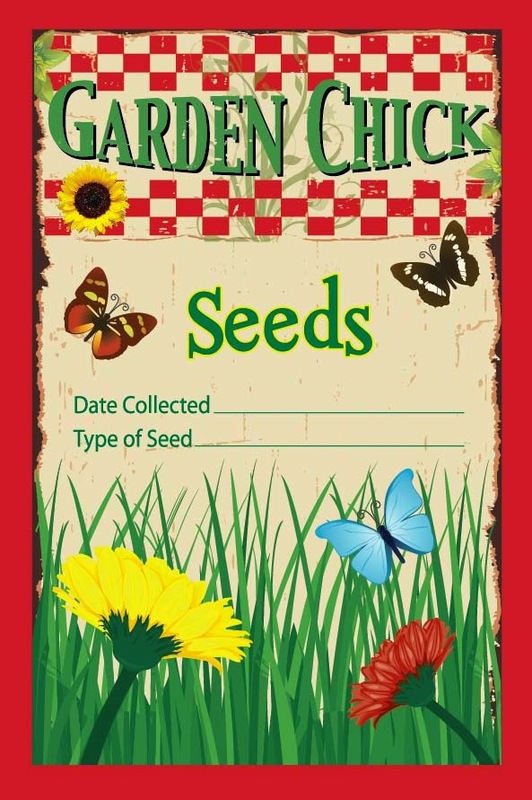 Saving your seeds for next years garden is a great way to save money, and share your garden with friends. Click on the picture to go to a pdf file to print off the template. Situated at the bottom of the steps on my back deck is a small herb garden. I have had the garden for years and it has undergone a lot of transformation. It is one of my favorite places to sit and just think. My garden contains not only herbs, but purple iris, orange day lilies, pots of hens and chicks, and a variety of annual flowers to add color. 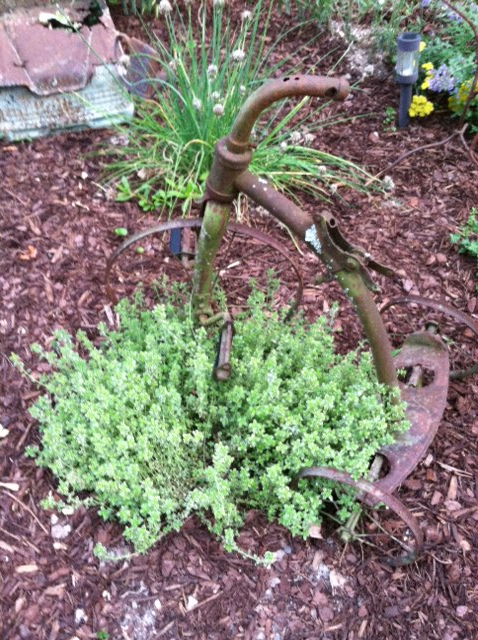 I like whimsy in the garden, and as you can see by this picture, a lot of my junk market finds end up here. thyme. In the background you can see an old car that my son found in his yard when digging up plants. Of course, he knew just who would want it! Pineapple mint is overflowing by the end of the summer. 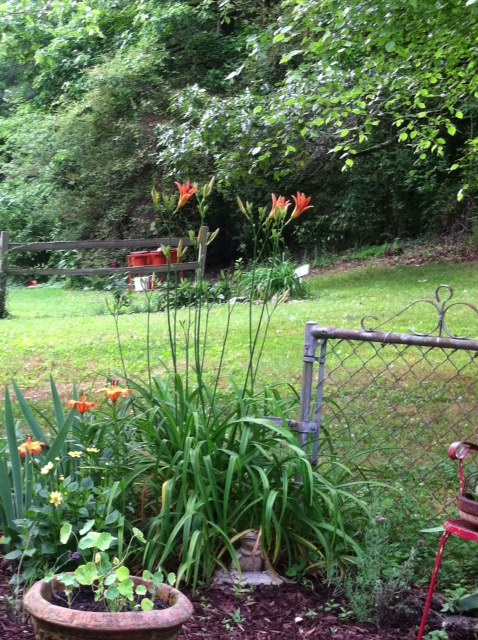 An old gate provides a backdrop for the garden and is great for helping to stake large plants like iris and orange day lily. Plants in my garden include lavender, and lots of it. I had to remove my old lavender plants this spring because they had become woody and were splitting. Wanting to try something new, planted Spanish Lavender and I wasn't as happy with it. You can't use the buds to dry because the flowers are feathery. I'm not sure they will overwinter, but I plan on adding the Hidicote Lavender which does so well in my garden this spring. 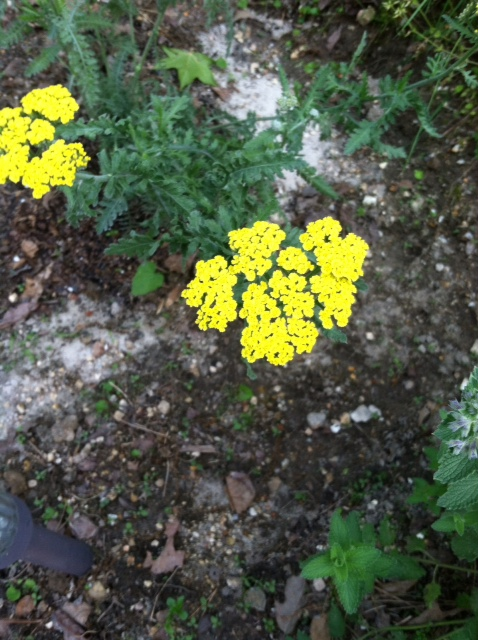 Yarrow made it into the garden this year as well as some small bush type dahlias from tubers. The Russian sage planted last year has returned and is doing well. I also added a fig bush at the corner, so you are not limited to just herbs in the garden. Herb gardens are a great addition to your yard. 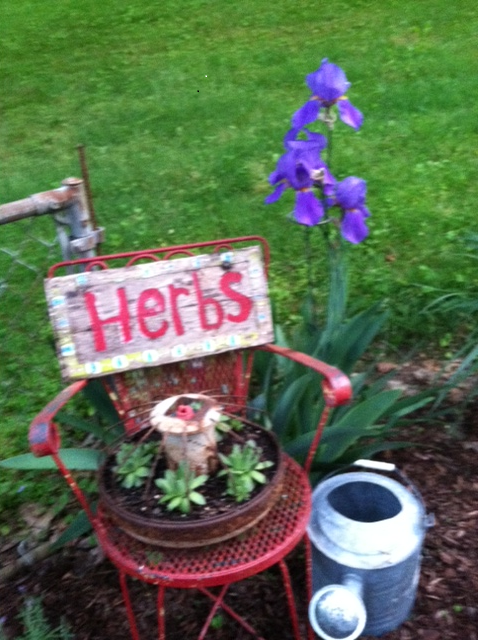 You don't have to limit yourself to just herbs if you designate a specific spot for your garden. 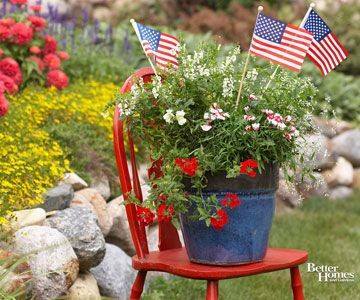 Herbs can also be tucked in the vegetable garden or placed in pots. They just need a well drained, sunny spot, and you shouldn't have any trouble. The small downtown area where I live is a great place for walking. Sidewalks circle several blocks around the elementary, middle, and high schools. People walking their dogs, pushing babies in strollers, and kids riding bikes are a common site as the summer cools down. I went for a walk the other night and passed one of the houses along the street. I spotted this flower, and post a question on my facebook as to what it was. 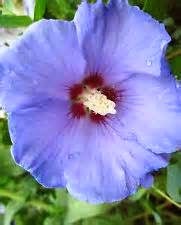 I thought it was a large hollyhock and was partially right. 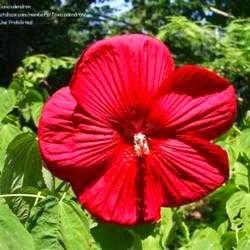 It is a Hardy Hibiscus, and is a cousin of the hollyhock. It towers several feet high and was placed up against the fence surrounding the yard. Paired with purple coneflower and yellow rudbeckia it made quite a display. Available in a wide range of colors including white, blue, crimson, pink, and purple. Prefers a sunny spot where soil is rich and drains well, but remains damp. Japanese beetles should be controlled by picking them off, or spraying with a strong jet of water. Don't use those beetle traps they only attract more. 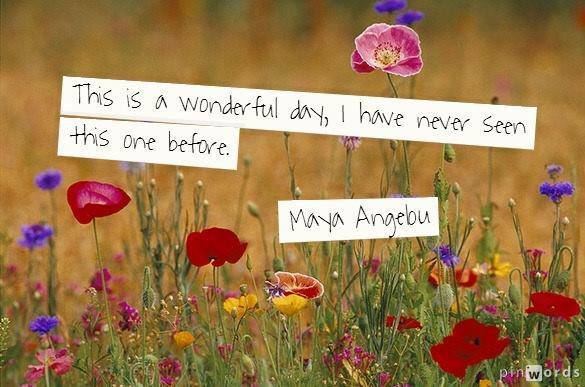 I prefer not to use pesticides since I have bees. 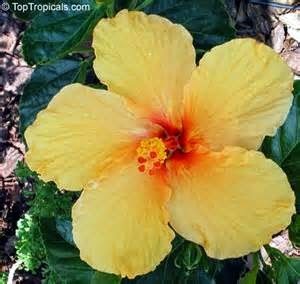 It is difficult to divide and replant hibiscus so they should be propagated through seeds or cuttings. When planting seeds, either purchased or harvested from your own plants, nick the seed coat with a knife to allow the seed embryo to take up water and germinate. To take cuttings, use a 3 to 4 inch piece taken from young growth. Root it in moist sand, perlite, or a rooting medium of your choice.I like to use a rooting hormone which will help speed up the process. It takes 3 or 4 weeks for the new growth to emerge. 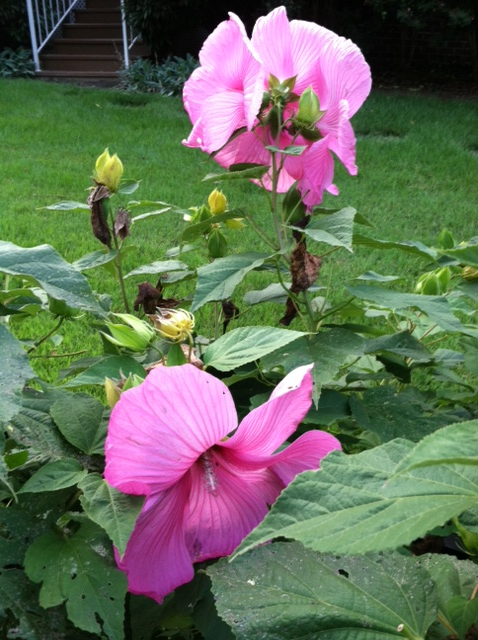 I believe I have the perfect spot for hardy hibiscus next year in my garden. Right up against my split rail fence, mixed in with the rudbeckia, and purple coneflower, and bee balm Since yellow and red are my favorite colors, I will be scouring the seed catalogs for those colors. Every year we make homemade ice cream in our electric ice cream maker. Usually on July 4th and maybe one or two other times during the year. I remember when I was young taking turns turning that handle on our old hand cranked ice cream maker. I'm sure putting all the work into the process of making it, made it taste even better. Now, it's quite a find when you can buy them at an antique shop or local flea market. 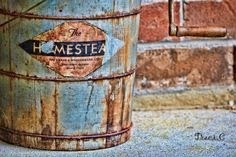 The patina on the old wooden ones are beautiful. One of my son's favorites, and now my granddaughter's is the Banana Split Ice Cream. I'm not sure where my husband found it, but the recipe, stuck between the pages of a recipe book is dated 5/28/03. Mix all ingredients together, place in ice cream maker, and fill can to the fill line with whole milk. Follow directions on ice cream maker until finished ice cream. Way, Snickers, and Butterfingers are our favorites. We choose one. You can process the Butterfingers in a food processor to break into pieces. Milkyway, Snickers, and other candy with a soft center should be broken up into small pieces and slightly melted in a microwave or on the stove top. Add all the ingredients into the ice cream maker, fill to the fill line with whole or 2% milk. Follow directions on your ice cream maker until finished. 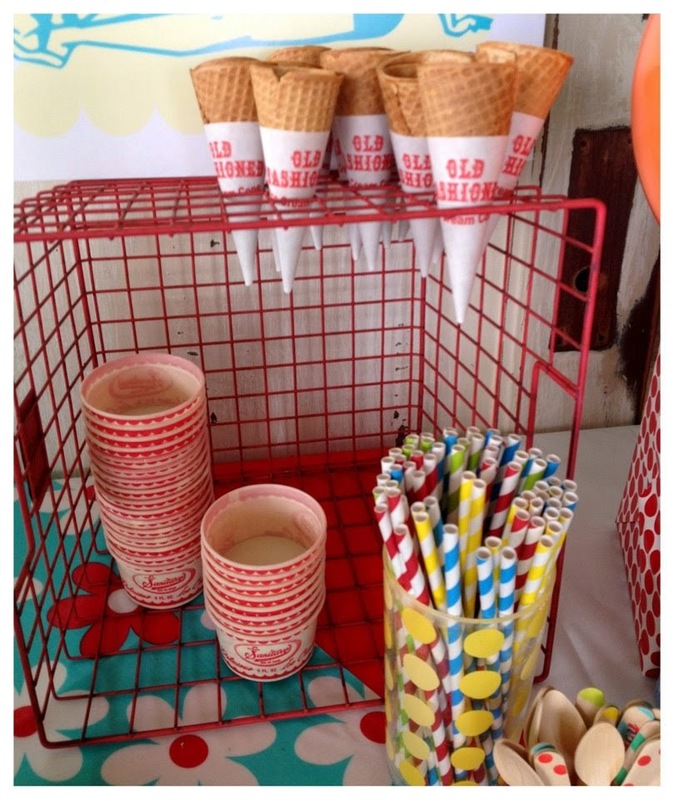 *Junket can be found in the grocery isle with ice cream toppings, and cones. I have wanted to have bee hives for several years but wasn't sure how they would fit on our property since I have grandchildren and frankly, my husband felt they would be a problem trying to mow around. But, being the person I am, I knew we could fit them in. I heard about a "mentor" program with the local beekeepers association. I waited a year, then decided to see if there was an opening in this years class. 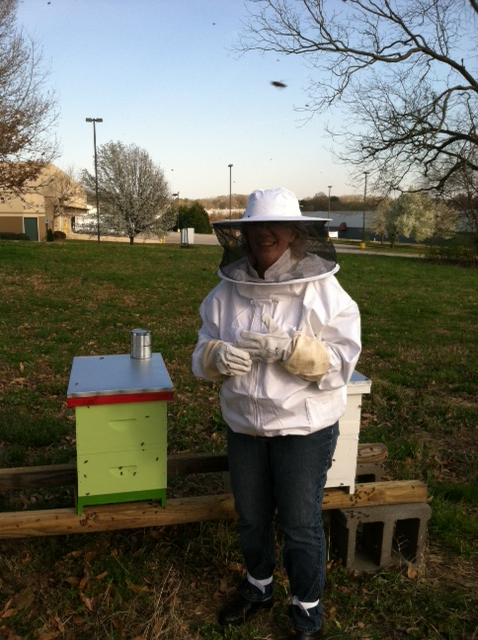 I joined in January, and our bees arrived in late March. 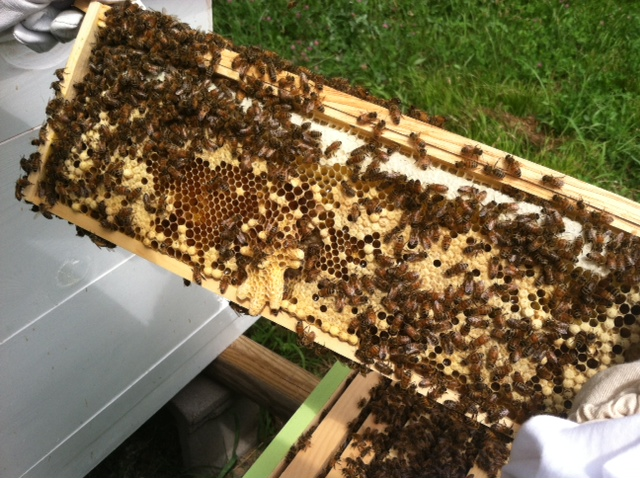 You can see here the initial hive has two boxes. These are brood boxes with 8 frames each. The bees lay their eggs and start rearing their young. This is a frame where the queen as laid her eggs. The nurse bees are capping the cells to allow them to grow and hatch out later. I like the mentor class because we all meet together at a designated bee yard where there are about 10 hives. 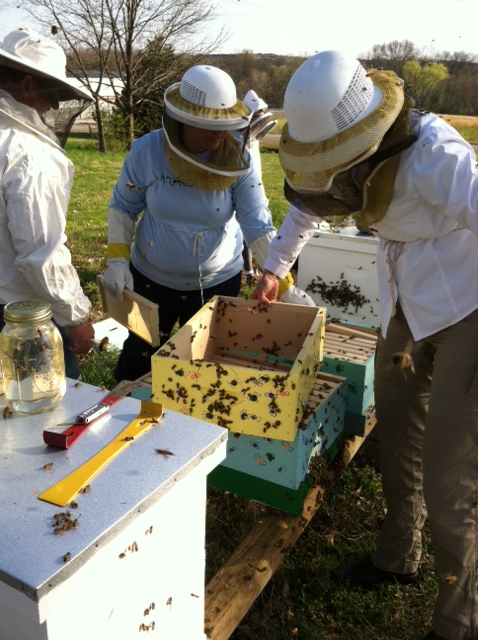 Our mentor gives a talk, we get to ask questions and we inspect our hives together. We also check our hives by ourselves at 10 day to 2 week intervals. When we first placed our hives we had to take sugar water out every 10 days. Once the flowers began to bloom, and nectar flow, we removed our water feeders. 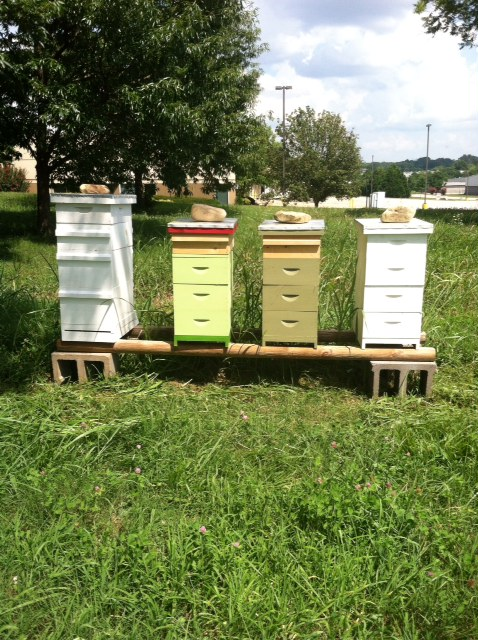 You can see now that it is the end of July, my two box hive is now four. The third box is full of honey for the bees winter stores. The fourth was added a couple of weeks ago in hopes they would save me a little! Our class meets August 2 and we will remove our honey for our on personal use. Each frame yields a quart of honey and I hope I have at least a couple. My hive comes home in August, and since I have been working with the hives I see that bees are really calm, and should pose no threat to us or our neighbors. For me, this blog is my journal. It helps me chronicle my dreams, my accomplishments, and hopefully imparts a little knowledge for those who love to garden, like the simple life, or have hopes of owning their own business one day. I am sure my friends, family, and other bits of trivia will crop up frequently. Garden info and recipes will also be included periodically.